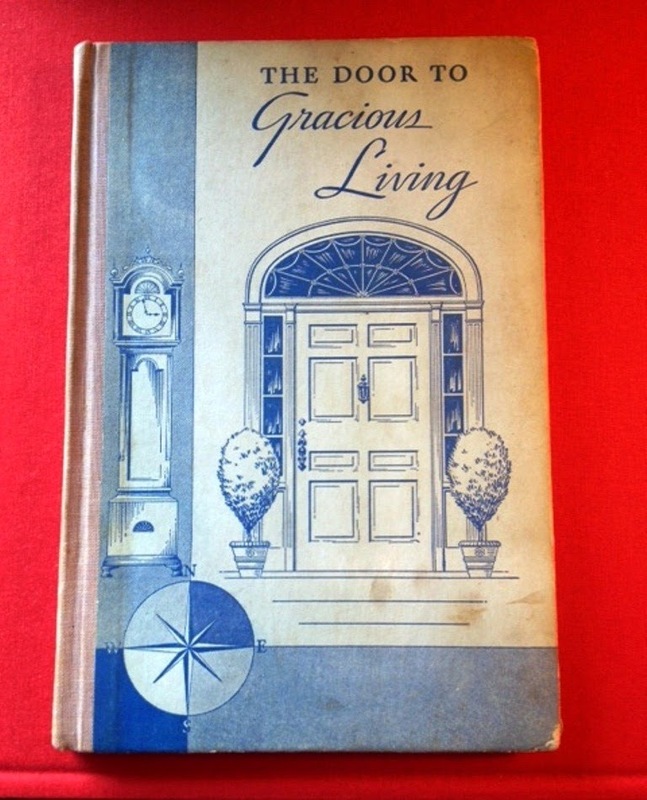 I recently bought the 1932 book, The Door to Gracious Living, based solely on its cover. The book turned out to be a compilation of articles that had been published in the old Delineator magazine. Some of the articles, especially those written by designer Joseph Platt, were interesting, while others, such as the one about how to deal with children who lie, didn't quite strike my fancy. No matter, though, because it's the book's cover design that delights me. The stately door with its fanlight and sidelights and those neatly-clipped potted trees conjure up fantasies of the archetypal dream house with its front door that warmly implies, "Welcome Home". Dorothy Draper was a firm believer that the front door said much about the home behind it and was an opportunity to make a good first impression. In Entertaining is Fun!, Draper wrote, "Your home's welcome begins right at the front door." 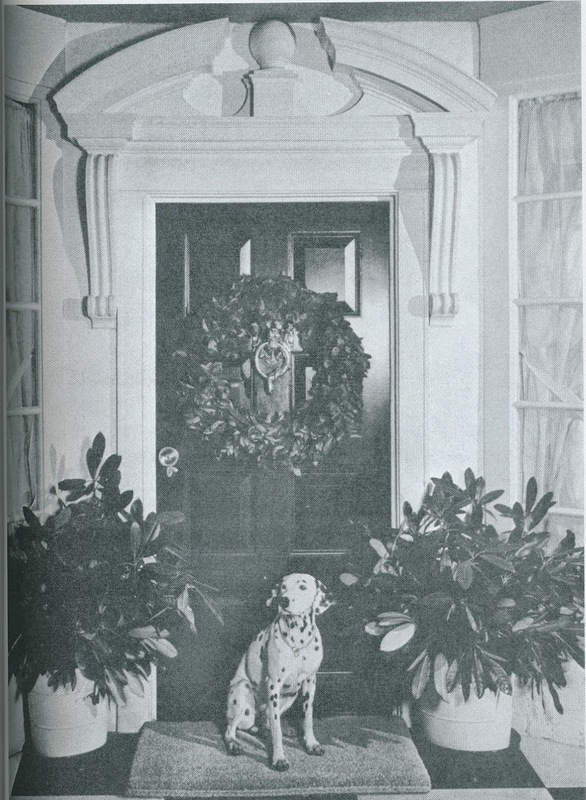 In the book's photo, below, you'll see that Draper advocated showy architecture, a glossy painted door, a laurel wreath, a big, brass knocker, potted plants, and a friendly-looking Dalmatian. I'm with Draper. 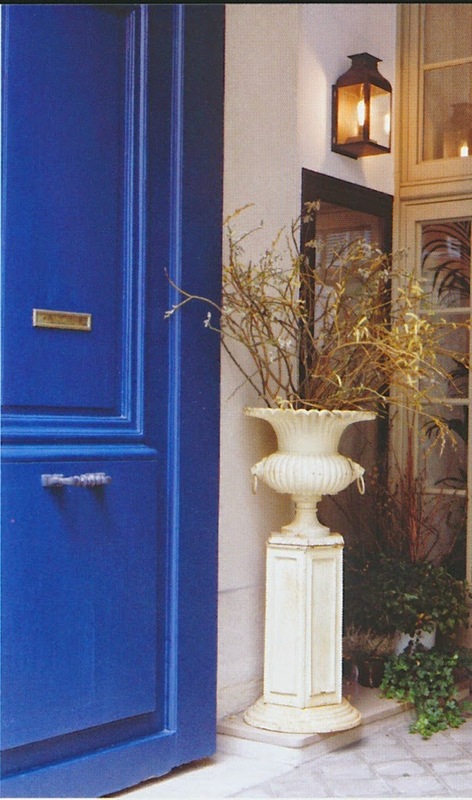 A front door should have a good paint job, some kind of tailored potted plants or trees, and rich-looking hardware. Of course, a dog is a must-have, too. 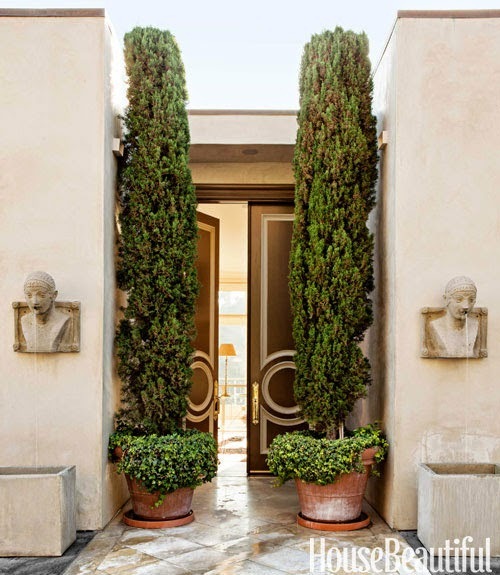 I found a few other photos of front doors that captured the essence of gracious living. Wouldn't you like to be welcomed by such snazzy front doors? Front doors were important to Dorothy Draper, as evidenced by both the photo and the illustration that appeared in Entertaining is Fun! The façade of the Pavillon de la Reine in Paris. 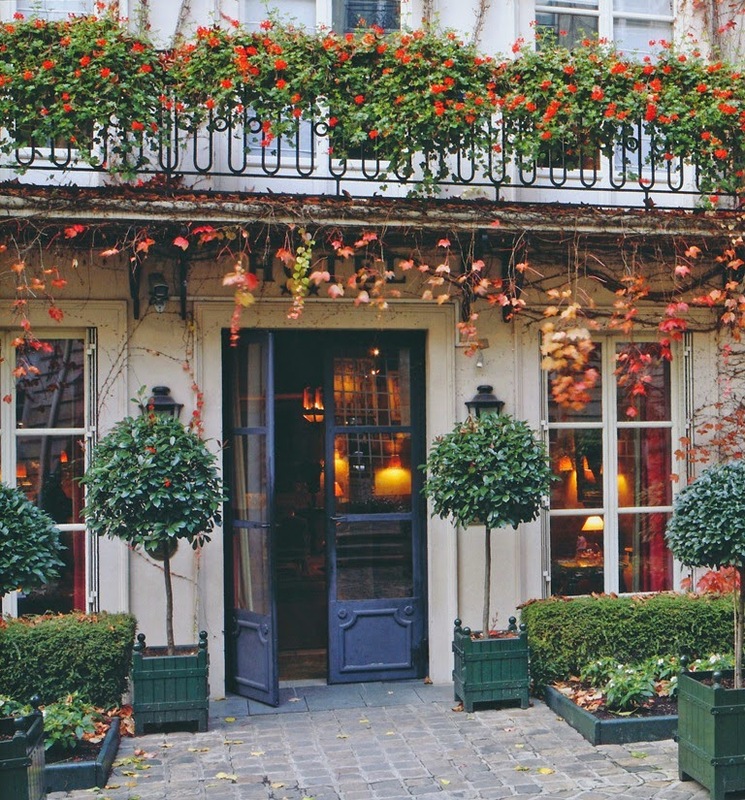 Not a door to a home, but rather, to a hotel: the Saint Vincent in Paris. 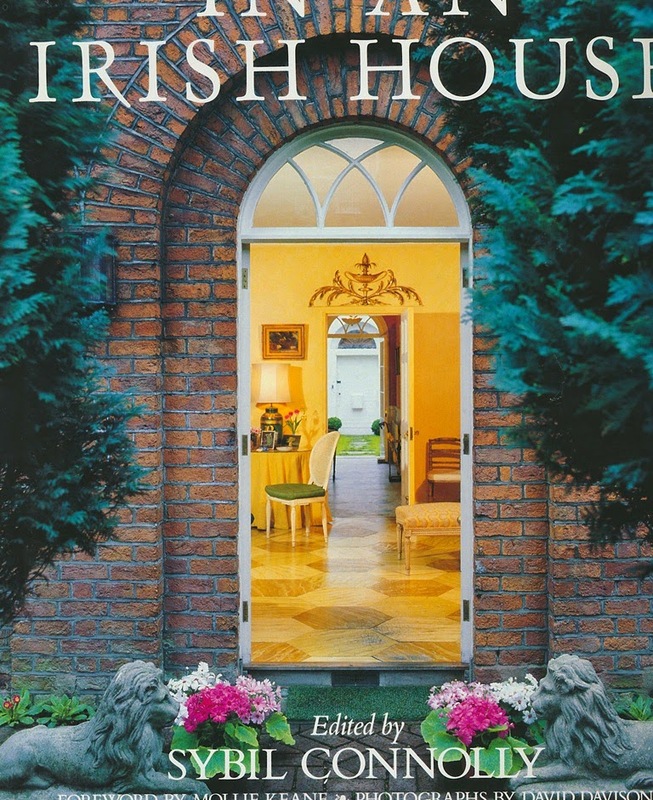 This front door appeared on the cover of Sybil Connolly's In an Irish House. 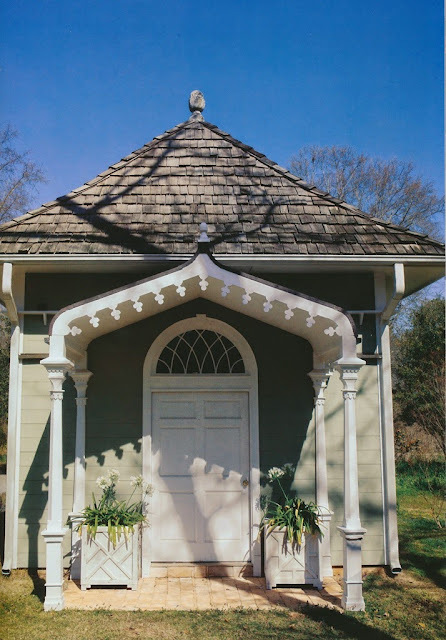 Much like the rest of Furlow Gatewood's houses, the front door of his pigeon house is a study in unstudied elegance. Draper photos from Entertaining is Fun! ; Paris hotel photos from Parisian Hideaways; Irish front door from In an Irish House by Sybil Connolly; Furlow Gatewood's pigeon house from One Man's Folly: The Exceptional Houses of Furlow Gatewood. 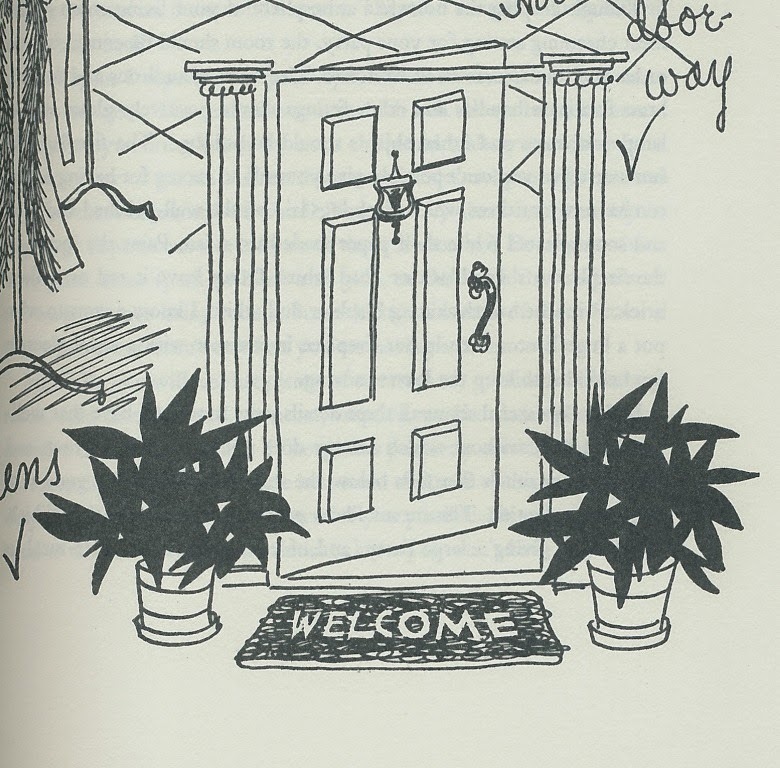 Jennifer, wonderful doorways and entrances have always intrigued and delighted me. LOve all of these examples; I try to always have my doorway as inviting as possible. I always love a good fanlight. I especially love the front door on the back of Living in Vogue. Robert Heber-Percy's Faringdon House, complete with clockwork watchdog and crystal chandelier! Clare, I just pulled the book down from my shelf and looked at the back cover. That is a charming front door! I like the sign that is attached to the door.